The #NECMBB race has mirrored the Twitter conversation surrounding it lately. Both were hot on Thursday night and as February approaches both will only get hotter. Here’s what went down on Twitter and the NEC hardwood on January 29. Winter Mondays mean NEC women’s basketball. But with an impending storm expected to wallop the east coast, this Monday’s schedule has been altered. Three of the five games will tip off earlier than originally scheduled. The Fairleigh Dickinson at Sacred Heart game, which was moved up to 3:30 pm, has now been postponed with a makeup date TBD. Only the Mount St. Mary’s vs. Robert Morris game remains set for a 7:00 pm ET tip-off. SCHEDULE CHANGE: Monday’s @SacredHeartWBB game vs. @FDUWhatsNew now to start at 3:30! Game will stream on @NECFrontRow if you can’t make it. #SFBKWBB: Tomorrow’s game vs. @CCSUBlueDevils will now tip-off at 3:00 p.m. due to the impending storm. Northeast Conference basketball players haven’t shown much concern for the cardiac health of their fans lately. In a span of just one week, three games went down to the final buzzer and the craziness doesn’t end there. Two of the teams involved in these dramatic finishes had the opportunity to experience life on both sides of a buzzer-beating shot. 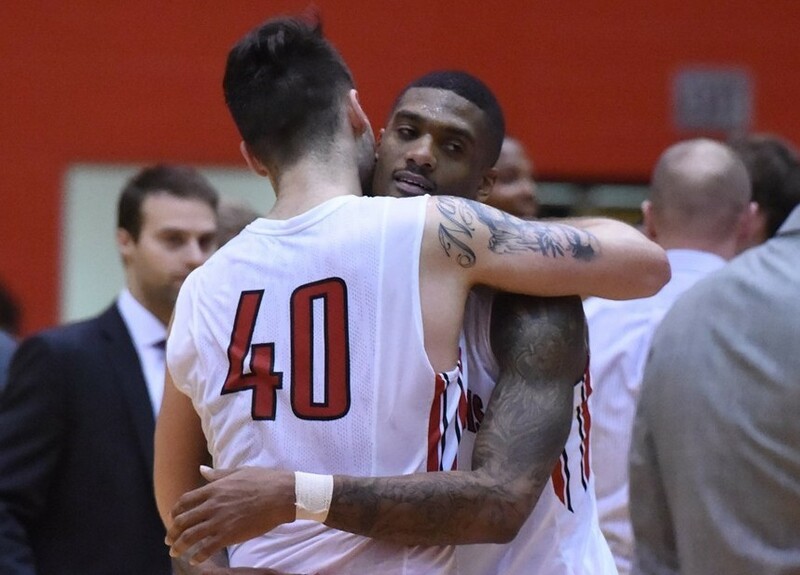 Within the last seven days, Saint Francis U and Sacred Heart fans enjoyed the thrill of a buzzer-beating victory as well as suffered the agony of a buzzer-beating defeat. Ronnie Drinnon (left) and Earl Brown (right) rode a roller coaster of emotions last weekend.